I am calling this new painting, a 30″ by 24″ canvas, Maverick. I hesitated about using that particular word for a bit, as it seemed a bit tainted for me by a certain past vice-presidential candidate from outside the lower 48 states. But it’s too good a word to let that person’s use of the word spoil it. A maverick is just a consciously active nonconformist, someone who makes the choice to separate themselves from the herd. I think many of us would like to think of ourselves as nonconformists or mavericks. But I don’t know how many of us ever really deserve that label. I know that I certainly don’t see myself as one, at least in the true sense of the word. I find myself all too often bending to the will of the crowd and staying in line. Oh, I still try to have my way and to do what I want in the manner that I want but I try to keep it low key without flaunting it or unnecessarily stepping on toes. Maybe if you were able to use an adjective in front of the word. An anxious nonconformist or a fretting maverick. Maybe then I would put myself in that category. And even then, probably not. I mean, what kind of maverick cares what they are called? They just want to do their thing without any hassle and the opinions of others be damned. And that’s kind of what I see here with the Red Tree on a rocky outcropping away from the other multi-colored entities that seem to be primarily focused on the issues of themselves and their neighbors. Looking at the lower part of this piece reminds me of a microscope image of the endoplasm of an amoeba as it pulses and churns. It all seems inward and involved only with what is around it. It can’t see much beyond its own cell walls whereas the Red Tree, having freed itself from those struggles, is able to focus on other matters- the sea, the sky, the sun, and its place in that realm. A perspective that encompasses things well beyond itself. Well, that’s my opinion. If you’re a maverick you most likely won’t give much of a damn what I think. Good for you. A picture must not be devised but perceived. Close your bodily eye, that you may see your picture first with the eye of the spirit. Then bring to light what you have seen in the darkness, that its effect may work back, from without to within. I find myself identifying strongly with the words and work of the 19th century German painter Caspar David Frederich (1774-1840). His work often takes a symbolic stance with expansive landscapes that overwhelm the human presence in them and much of it moves toward the metaphysical. He , along with his British contemporary JMW Turner, were at the forefront of the movement from Classicism to work that reflected the inner emotional reaction of the individual to the world around them. 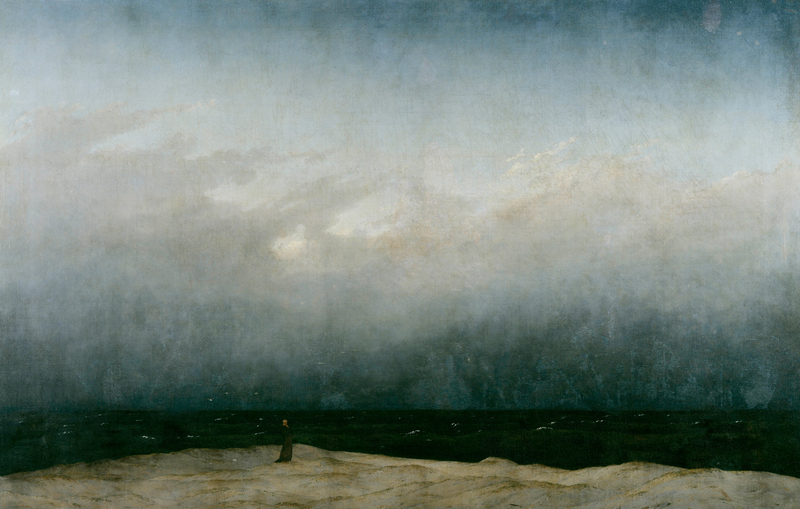 It was said of Frederich that he was “a man who has discovered the tragedy of Landscape.” I see this in his often moody and contemplative work. It is not painting of only a place or scene– it is more a painting of emotion, of some inner vibration triggered by what is before the painter. His brilliance is in capturing that inner element and revealing it to the viewer. It’s a rare thing, one that I think most painters aspire to obtain in their own work. I know that I do. Frederich’s work fell from favor in the latter stages of his life but the coming of modern art movement whose many painters were greatly influenced by Frederich, brought him back to great recognition through the first few decades of the 20th century. Unfortunately for Frederich, in the 1930’s, his work was associated with the Nazis who mistakenly saw his work as being nationalistic in its symbolism. 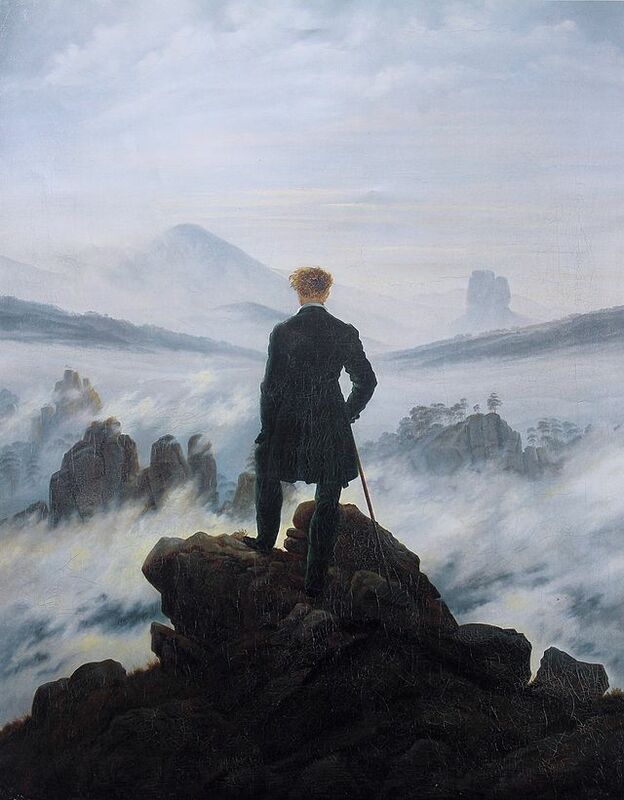 I know that the piece shown here on the right, Wanderer Above the Sea of Fog, is often associated with Friedrich Nietzsche‘s idea of the Übermensch or Superman. Even though Frederich died years before Nietzsche was born and almost a century before the Nazis usurped his art, it took several decades before his work regained the stature it lost due to this association. 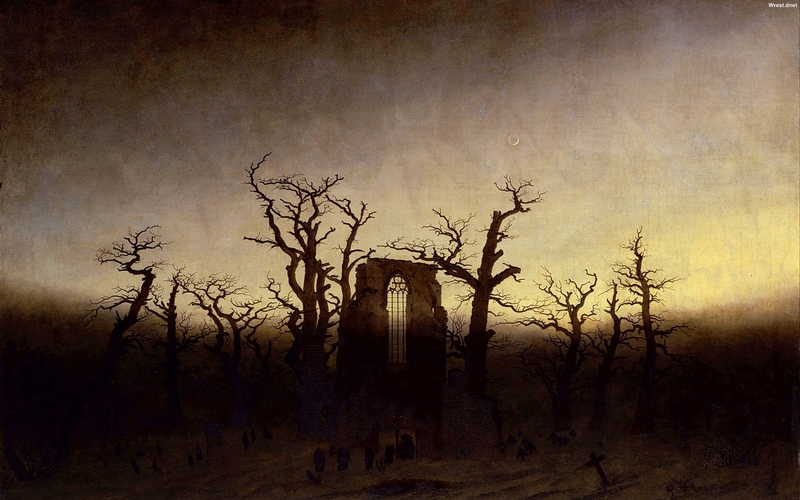 But the inner message of his landscapes persevered and his paintings still resonate with their timeless qualities today. As they should. A newer painting, this one an image of about 18″ by 26″ on paper. 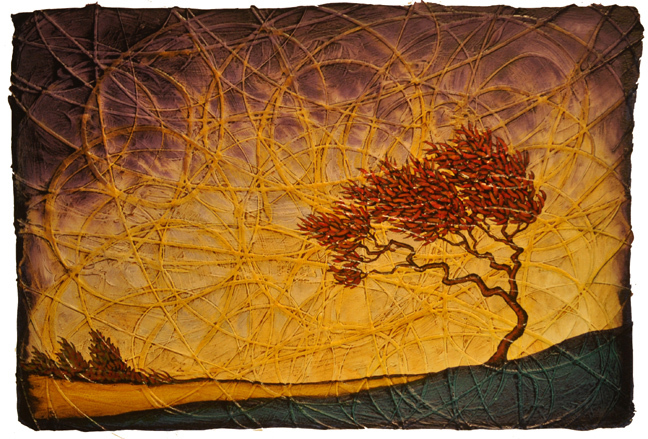 The composition is intentionally simple in that this piece is obviously very much centered on its color and texture. The stringlike twirls of its texture create a real feel of motion and energy underneath the image, the hint of the hidden forces of nature that exist just beyond our ability to recognize or comprehend them. I don’t know if I would call these purely physical forces or if they somehow become a spiritual force as well. For this painting, let’s assume that they are both. Sri Aurobindo’s vision of the future includes the appearance of what may be called a new species, the supramental being, a divine being which would be as different and superior to present humanity as humanity is to the animal. It would have a consciousness different in kind than the mind of the human, a different status and quality and functioning. Even the physical form of this being would be different, more luminous and flexible and adaptable, entirely conscious and harmonious. Between this supramental being and humanity, there would be transitional beings, who would be human in birth and form, but whose consciousness would approach that of the supramental being. These transitional beings would appear prior to that of the full supramental being, and would constitute an intermediate stage in the Earth’s evolution, through which the soul would pass in its growth towards its divine manifestation as the supramental being in the earth nature. It is an interesting concept and one that I feel fits the imagery of this painting. However, I did think about how the concept was similar in nature to Nietzsche’s Superman or Ubermensch and the use of that idea by the Nazis, how it could easily be diverted from its original meaning and twisted to rationalize behaviors far from the true nature of the concept. It’s unfortunate that many ideas that are concerned with the betterment of all people are often perversely used to divide and destroy people. Here, I am thinking of this concept in the purest sense, of the elevation of the individual to a higher state of being, aware of and in harmony with all the forces of this world. Interesting quote. I know that my life is made more cheerful from work, love and art. It’s the knowledge part that I find myself questioning. Sometimes it feels that knowledge takes away cheerfulness, as thought the more we know the more dire the situation seems. But I realize that I’m confusing knowledge with information. Knowledge is taking information and having the ability to use and cope with it, to see how information fits into a larger framework. A distinct difference there and one that most of us confuse. We’re bombarded with new information all the time, in an endless barrage of charts and numbers and words. We are living in the world of information today, after all. And after taking it all in feel as though we’ve obtained knowledge. So, maybe Nietzsche is right after all. Having true knowledge, an ability to cope with all this information in a coherent manner, would cheer me up. I guess I’ll keep trying to gain some. I would so much more enjoy living in the world of knowledge than the world of information.